Challenge: I’m going to repeat this one on September 29th, maybe with a vest and no partitions, to see how much time I can cut from my 51:20. That’s one month out from my running of Marine Corps Marathon so it seems like a perfect challenge. Anyone can jump in with me!!!! 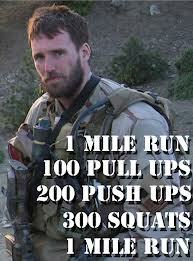 Awesome workout, awesome Memorial Day tribute! Hello from socal!!! I’ve been checking the wkroouts everyday I’ve been gone but I usually don’t have enough weight because I’m using the bar and metal plates I have here. Today I was only 10lbs off the rx weight for the metcon so I did it. I got a round of four the first round of three mins, and the rest of the rounds, I completed 5 rounds. It was a fun sprint workout, I just wish I could have been there with the actual weight!! !